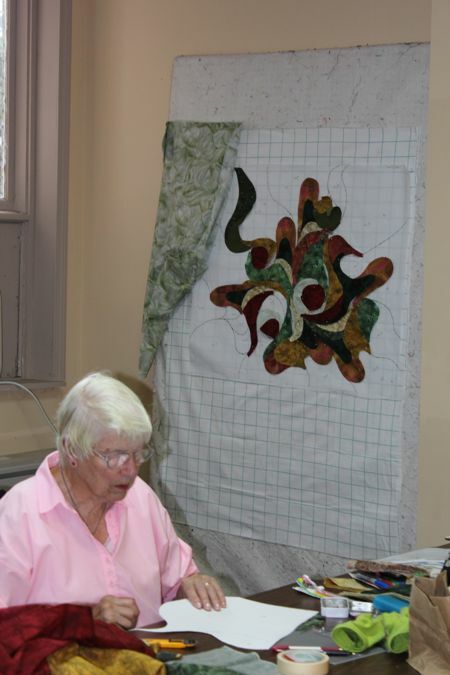 Every year from 1990 to 2011, a small group of quilters gathered in the village of Greensboro, Vermont to attend a quilting class with me. Classes usually had 15-20 students and were held in the small building behind Highland Lodge appropriately named “The Playhouse” but in winter it served as the ski shop and for several weeks in September, it was transformed into “The Studio”. 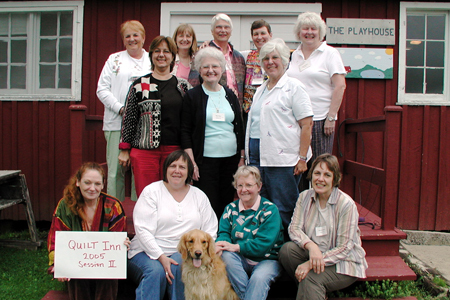 Here’s a shot of the 2005 Quilt Inn group. Two years ago, the Lodge closed and I was winding up my teaching career, but Quilt Inn had become such a tradition that it seemed a shame to just bring it to an end. So the event has morphed into a reunion/retreat, where students work under my guidance but I don’t actually teach. 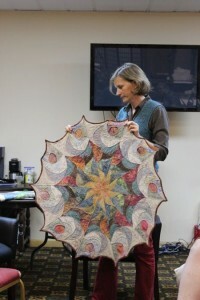 It’s now held in Maine and the group that attends is knowledgable about design and curved seam piecing techniques and needs only occasional advice from me. As always, we started the session with show and tell. Here is Sarah with her project from last year, and Jane with a design she worked on last winter. 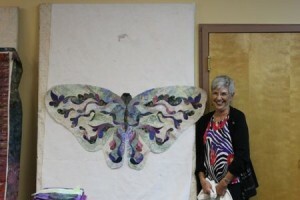 Kristin made this lovely table runner just so she would not come empty handed to Show and Tell and Marilyn proudly shows the butterfly she designed in class last year. The photo doesn’t show it very well, but all those embellishments on the butterfly wings are pieced using many different colors and prints! Trudy and Kathy are a mother/daughter team. Trudy, ever the intrepid one, is showing the star design she pieced from lamé and cotton fabric. Small lights are inserted in the points of the stars to add a little twinkle! 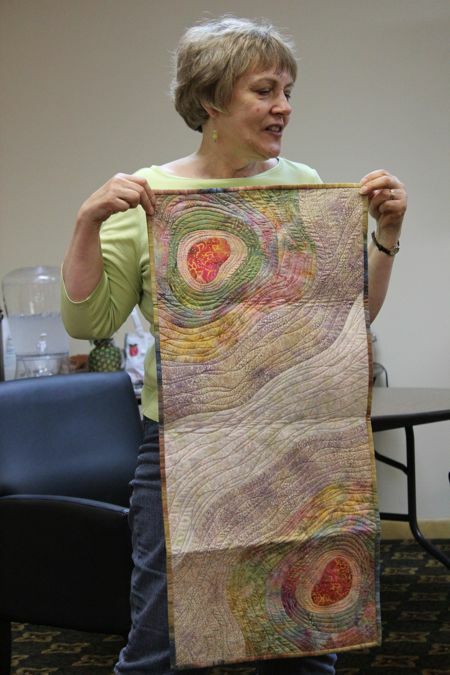 Kathy’s quilt, right, features fabrics she created using her own photographs which she sells on Spoonflower. After getting caught up on the news from the year, a delightful dinner and show and tell, we retired for the night to rest up for the marathon quilting session that was to come. It turned out that meals for the week provided much of the entertainment. We either went out to eat, ordered meals brought in, or foraged, but it turned out that organizing and procuring food was an interesting challenge that provided much entertainment. And, of course, we did not starve!! We took notes so that next year we will be much better prepared and organized. I provided a number of small motifs that contained anywhere from 5 to 20 curved shapes. 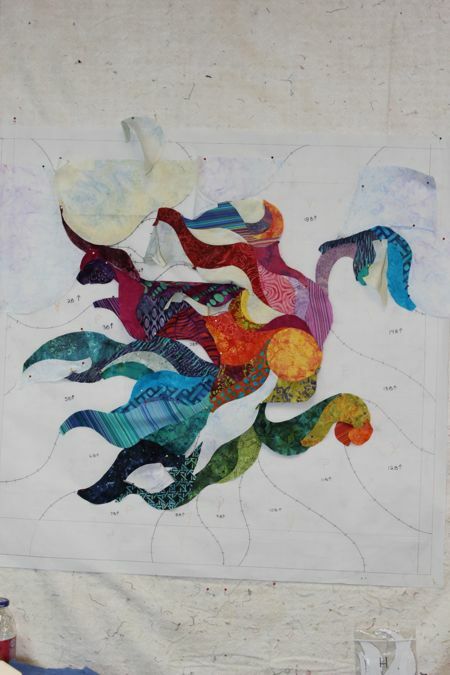 Everyone worked with the motifs that appealed to them, manipulating and combining them to create a larger design. It was evident by the progress made during the week that starting with the motifs really jumpstarted the design process. Here is Sarah’s project. 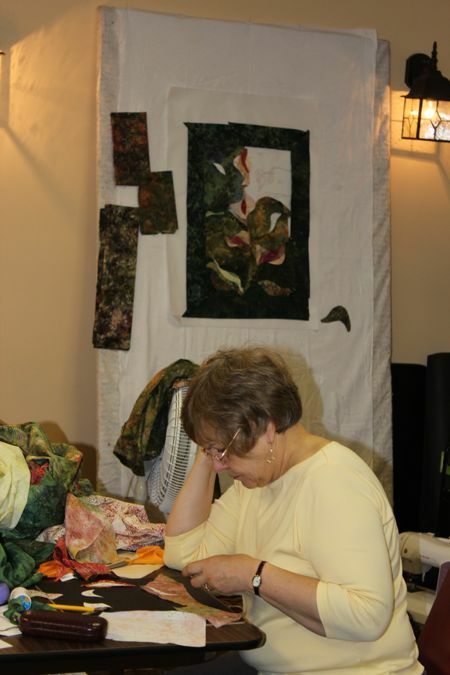 By the end of the four day session, she had half of her design sewed together and planned to spend the next day sewing while she waited for her family to pick her up. I can’t wait to hear if she actually managed to finish the piecing. 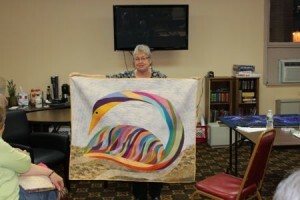 If she did, it is certainly a Quilt Inn record!! Here are Trudy, Kathy and Kristin’s designs. You can see that they are all wonderfully curvy and progressing very nicely. One of the advantages of not actually teaching during the four days is that I can work on my own project. 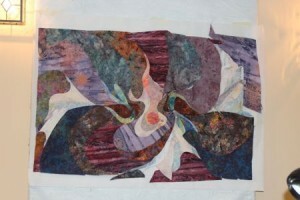 For the second year in a row, I worked with only purple fabric as I chose to work on one of the paraments for church. I got it designed and had started sewing, so I made good progress also. I will show more of it in my next posts. Packing up and leaving yesterday was hard. We build such a feeling of community as we work. We hear about each other’s families and the happenings of the previous year. We encourage and consult about the work we are doing and basically build strong friendships and creative partnerships. Kristin and Kathy both decided they needed to make a trek to Keepsake. They hardly knew each other when they took off together (Kathy was at Quilt Inn for the first time), but after five hours in the car and a delightful hour shopping for fabric, they came back as buddies. Such is the life of quilters. 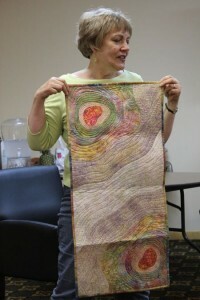 I noticed on Facebook this morning a post and link about the “health benefits” of quilting. 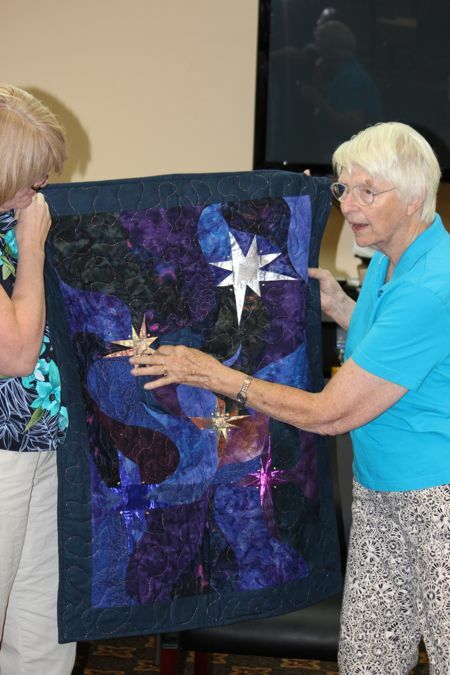 The article grandly announced that physical exercise was not the only way towards good health–mental and emotional health are also essential and quilting promotes that. This entry was posted on Saturday, September 14th, 2013 at 12:55 pm and is filed under Quilt Inn, Uncategorized. You can follow any responses to this entry through the RSS 2.0 feed. You can leave a response, or trackback from your own site.